There’s been a lot of discussion regarding the warm or cold blooded nature of dinosaurs. The traditional belief was that they were cold blooded, like today’s lizards, but an increasing amount of evidence indicated that they could regulate their body temperature, like today’s mammals. Now, a new metabolic study showed that the answer is somewhere in between: they could regulate their bodily temperatures, but only up to a point. “There’s a third way,” says John Grady, a biologist at the University of New Mexico in Albuquerque. Today, that third way is represented by animals as turtles, tunas, and some sharks (among others); they are called mesotherms (literally medium temperatures). Grady believes that by understanding how these animals regulate their body temperature we could find out more about how dinosaurs did it. Mesotherms create heat by burning food, but they can only heat their body up to a point. Tuna, for instance, usually stay up to 20 °C warmer than the surrounding water, but when they dive deeper, to colder waters, their metabolism slows down, and their temperatures get much lower. He and his team compiled a database of growth rates in 381 animal species, including 21 dinosaurs. The analysis, published today in Science, took data from earlier studies that estimated growth rates in a number of ways. For dinosaurs, you have a number of hints to help you estimate growth rates, size and age of an individual. For example the number and size of growth rings in fossilized bones can indicate the age and growth and the overall length of the bones indicates the mass. They then compared these growth rates with those of reptiles and mammals (which are 10 times faster); on this scale, dinosaurs ended pretty much mid way. This “in between-ness” might have given them a significant ecological advantage: they would have been able to move around much faster than today’s reptiles, but they would require much less food than today’s mammals. This also indicates how the metabolism of modern animals evolved. The metabolism of birds and mammals for example likely took hundreds of millions of year to reach its fast rates. 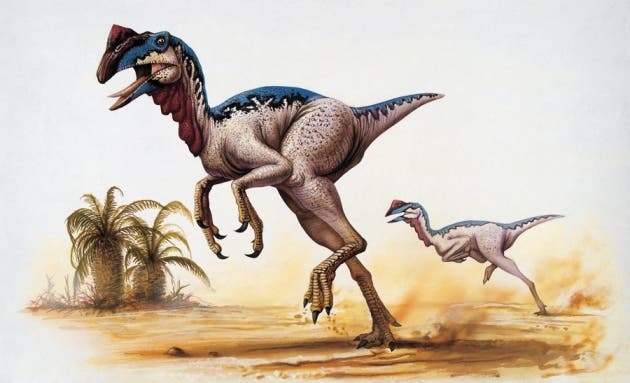 Most birds today reach adult sizes in a matter of weeks, but the earliest birds, like for example Archaeopterix, probably took a much longer time to grow.